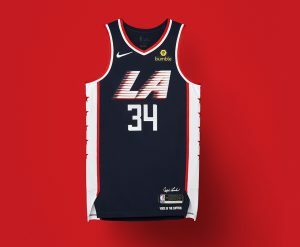 In the past few weeks, NBA teams have been revealing their new Nike “City Edition” uniforms, new, flashy alternate uniforms that are designed based on the heritage of the city. This is the second year in a row the NBA and Nike have done this, with last year’s uniforms being a humongous hit. honoring Kobe Bryant, the Jazz “Redrock” jerseys, paying inspired by the landscape of southern Utah, and of course, the big hit, the Miami Heat’s “Miami Vice” uniforms. This year, the teams brought the same creativity, some teams drastically changing their designs, while others went with the mindset “If it ain’t broke, don’t fix it,” opting for either no changes or minimalist changes. *This list is purely subjective. **The Utah Jazz “City Edition” jerseys were not considered since they are the same ones as last year. The Nets regular uniforms are simplistic, and so are their “City Edition” uniforms. 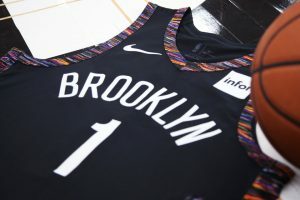 However, the Coogi sweater pattern on the trim of the uniform, a tribute to the late Brooklyn icon Notorious B.I.G. on top of the Nets black kits make for a special combination. Some critics say the design is too small, but sometimes less is more, and that concept definitely reigns true here. 8/10. The Clippers churned out these beauties this year, paying homage to when Los Angeles hosted the 1984 Olympics. The logo is reminiscent of the 1984 L.A. Olympics “Stars in Motion” logo, which the United States team won gold in basketball at. The jerseys definitely give off that USA Olympic vibe, which can never hurt a teams performance on the court, right? Look good, feel good, play good after all. 8/10. 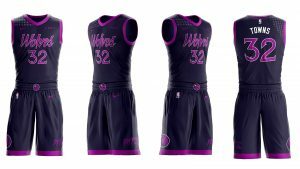 The Wolves are set to look sharp on the court this year in their new “Purple Rain” jerseys, inspired by their late hometown hero Prince. The black jerseys with the purple font, plus multiple Prince references on the jerseys like the right shoulder design, which was modeled after the jacket Prince wore when performing “Purple Rain” make this one of the cleanest and most creative jerseys in this year’s bunch. 8/10. 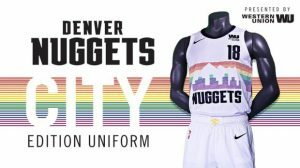 The Nuggets “Rainbow Skyline” uniforms will be making a comeback, 25 years after they were retired as the team’s main uniforms. The modern update of the classic 1980’s design should be a fan favorite when the Nuggets wear them seven times later this year. The Nuggets “Skyline” jerseys are easily the best they have ever worn, and are some of the most classic jerseys in NBA history, so it should be interesting to see their revival. 9/10. 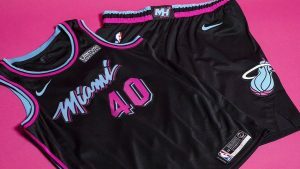 The Heat won last year’s “City Edition” crop of uniforms with their “Miami Vice” uniforms, and somehow these “Miami Vice” ones are even better. The team opted to keep the design, but instead of having it on a white uniform, they put it on a black uniform. When Heat guard Dwayne Wade was asked about the updated uniforms, he said “The white was cool. But I think the black is what everybody has been waiting for,” basically summing up what everyone was thinking. The jerseys are meant to be a nod both the team’s history, and to the city in the 1980’s. Overall, the jerseys are just pure fire. 10/10.